Today is the 1st of June 2015. Despite the huge strides that Ireland has recently taken, most notably in marriage equality, it seems, at least in medicine, we may have officially reverted to the dark ages. Despite wonderful world-renowned experts like David Healy and Peter Gotzsche making huge strides in making medicines safer for us all, three articles today in the Irish Independent shows just how far behind Ireland trails in pharmacovigilance. Professor Patricia Casey, University College Dublin (UCD) – Among the usual defence of the drugs, drugs, and more drugs, she states “Is non-treatment adherence and ultimately suicide an unintended consequence of the (black box) warning? This question cries out for an answer as life itself is at stake.” Eh, this study that Professor Casey refers to was done in Ireland – Ireland doesn’t have a black boxed warning Patricia! Brendan Kelly, also of UCD, decides to ignore the FDA, EU and HPRA warnings altogether. He states “Public debate about anti-depressants tends to be polarised to a point that is deeply unhelpful, especially for people with depression. The truth is that anti-depressants are not the magic bullets that some people hoped. But neither are they the evil little pills they are sometimes portrayed as”. Have you actually read the (drug company) leaflets Professor Kelly or did this come directly from a conversation you had with your colleague Casey? Dr Suzanna O’Sullivan, National Hospital for Neurology and Neurosurgery, this time from University College London, takes the proverbial biscuit. She says that “people shouldn’t pay too much attention to side-effects leaflets or they are likely to start experiencing the conditions psychosomatically” and further “Don’t read the side-effects labels on medication too closely… All these symptoms come from something already existing in your mind and your imagination”. Yep, never mind that the victims and their families are saying otherwise, take that pharmaceutical drug company pill or the sky will fall in (and the experts may be out of a job). Interesting that all 3 articles came out today in the Irish Independent. I might be a little optimistic here but maybe we, the victims and their families, are getting somewhere – the feathers of academia seem unduly ruffled today. 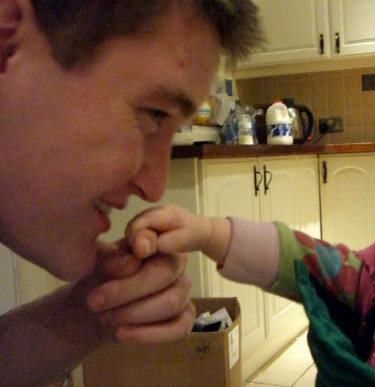 These articles come shortly after Professor David Healy’s ‘Medico-Legal society’ lecture at Dublin’s ‘Kildare St and University Club’, which myself and the bold husband had the pleasure of attending. The lecture concerned the dangers of taking prescription drugs, particularly antidepressants, and the legal implications of same. Following his talk, it seemed that many academics within the medical and legal profession are well aware of the dangers, despite what these articles and so-called ‘experts’ in the Irish Independent are saying today. ‘Independent’ being the definition of irony here. Incidentally, the European Federation of Pharmaceutical Industries and Associations (EFPIA) Code, which includes pharmaceutical payments to doctors, will come into effect shortly. Transparency issues are about to get much more interesting. As I was writing this another study was published, a Finnish-Swedish study that analyzed the link between psychotropic drugs and homicide risk. The study here found “that the use of certain drugs that affect the central nervous system are associated with an increased risk of committing a homicide. The greatest risk was associated with the use of painkillers and tranquillizing benzodiazepines, while anti-depressants were linked only to a slightly elevated risk.” Yep, harmless, whatever you do, don’t read the leaflet!! 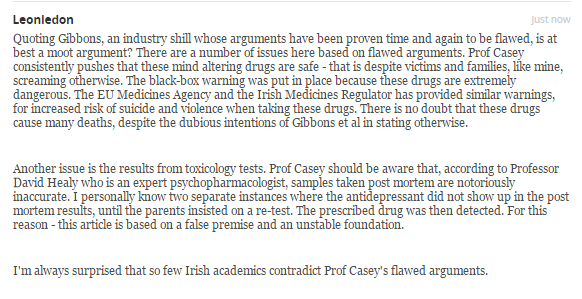 Professor Casey’s article appears in the Indo today ‘Mind and meaning: Antidepressants work‘. As usual, most likely for fear of legal repercussions by Prof Casey, the Indo never allow opposing arguments. My comment didn’t stay up for long and despite my best efforts at truth, I guess my constitutional right to freedom of expression doesn’t override the Irish media’s fear of another legal action by Casey. Comment below..
Hi Leonie, one question comes to mind, is there any research etc. or ‘accountancy’, that shows how much money from Big Pharma, is known to flow into the running of academic institutions in Ireland? Institutional integrity should be a given, but seems sadly lacking here.